I believe it’s can be a little late to talk about Christmas ornaments for some of you. Many of you opened the doors of your homes to the holiday spirit two weeks ago when December started. Shopping malls started in the middle of November. Your homes are probably decorated and Christmas trees full of ornaments in your favorite color by now. 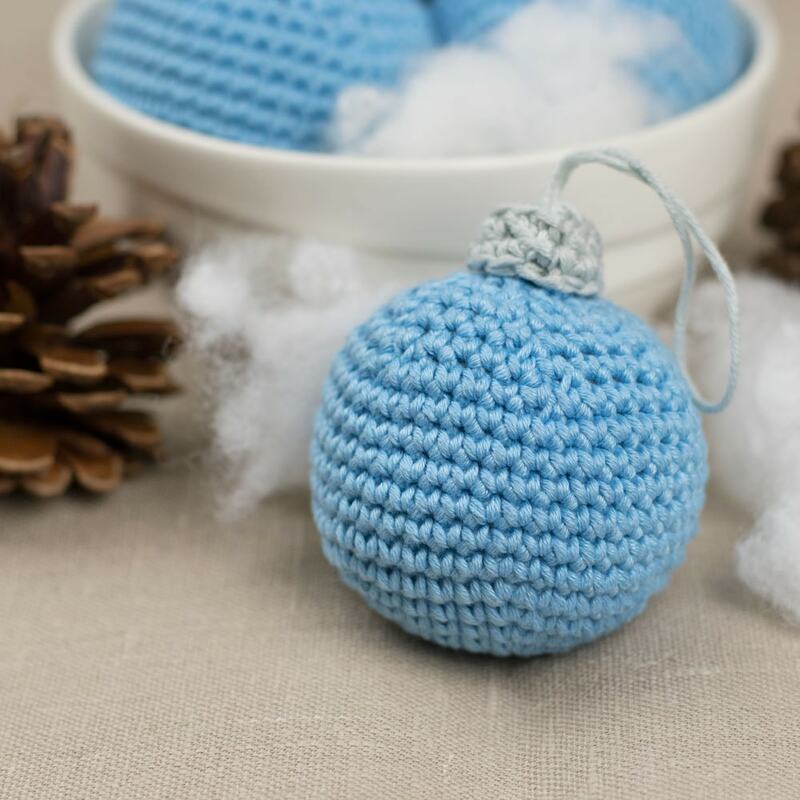 But even if all the branches of your Christmas tree are full, there is still a place for some handmade ornaments. Those special ones that are made with love and creativity of you or your little ones. Do you still remember those made from the pasta? Or paper snowflakes? They were so popular back when I was a child. Today we are going to be making a cute and easy last minute Christmas decorations. Get your crochet hook and yarn ready! For this pattern, I was using my 3.0 mm crochet hook and some DK weight 100% cotton yarn (here!) in color 2 or light blue. I was working in rounds, but instead of joining after each round I was just continue crocheting the next one. To create my first loop I was using a technique called a magic ring where you create a special loop and make your first round in it. The best thing is, the loop closes entirely and your fiberfill will stay in the ball. Make sure your stitches are made very tight. If you crochet rather loosely, try with a smaller crochet hook. The pattern is worked in rounds. Do not join at the end of each round, just continue with the next one. The pattern starts with a magic ring. 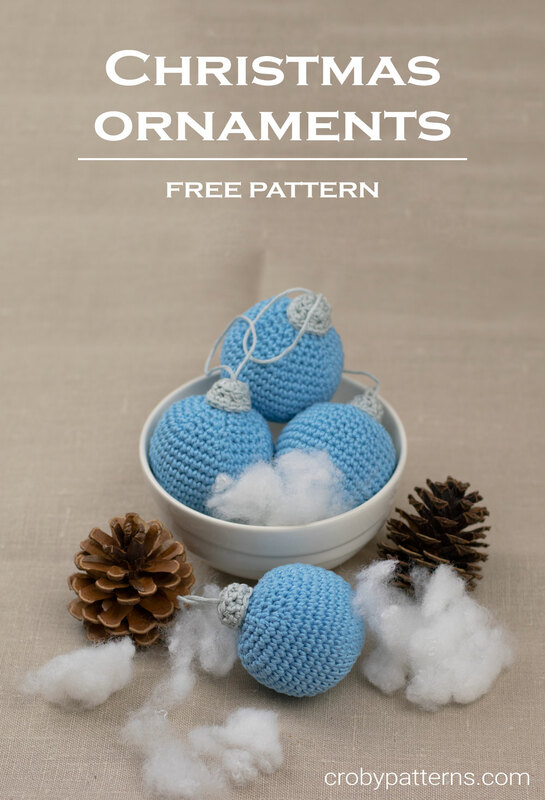 You can make 4 ornaments from 1 skein of recommended yarn. If the number is written before the stitch 3 hdc work 3 hdc into the same stitch, if the number is written after the stitch hdc 3 = work hdc into next 3 stitches. Make your decreasing stitches using invisible decrease stitch technique. Round 1: Work all in blue. 6 sc sts into the magic ring. Round 2: Work 2 sc in next 6 sts. Round 3: Work (1 sc, 2 sc in next st) 6 times. Round 4: Work [1 sc in each of next 2 st, 2 sc in next st] 6 times. Round 5: Work [1 sc in each of next 3 st, 2 sc in next st] 6 times. Round 6: Work [1 sc in each of next 4 st, 2 sc in next st] 6 times. Round 7: Work [1 sc in each of next 5 st, 2 sc in next st] 6 times. Round 8 – 14: Work 1 sc in each st around. Round 15: Work [1 sc in each of next 5 st, 1 sc2tog] 6 times. Round 16: Work [1 sc in each of next 4 st, 1 sc2tog] 6 times. Round 17: Work [1 sc in each of next 3 st, 1 sc2tog] 6 times. Round 18: Work [1 sc in each of next 2 st, 1 sc2tog] 6 times. Round 19: Work [1 sc in each of next 1 st, 1 sc2tog] 6 times. Round 20: Work 6 sc2tog. Take a needle and join all 6 stitches together. Leave a long tail before you make your magic ring.Round 1: Work all in light gray. 8 hdc sts in the magic ring. Join the round with a ss. Round 1: Work all in light gray. 8 hdc sts in the magic ring. Join the round with a ss. Round 2: Into back loops only. Ch 1. Work 1 hdc into next 8 sts. Ss. Round 3: Into both loops again. Work (1 sc, 2 sc in next st) 4 times. Ss. Fasten off. Take that long tail and create 4 fingers big loops. Weave all the ends. Fill the cap with a small amount of fiberfill and attach it on the top of the ornament. Share your creations with me on Facebook and Instagram using #crobypatterns. I sometimes include to my posts affiliate links to supplies I use. Purchasing from these merchants earns me a small commission with no extra cost to you, and goes towards supporting Croby Patterns.